The volume of data retained, managed, and accessed today is unprecedented. Businesses expect the IT department to keep data online and accessible indefinitely, putting intense pressure on the databases required to store and manage it. To meet today’s needs; we need to replace outdated and inefficient legacy processes with new, more agile techniques. SQL Server Replication is one of the techniques to accommodate such demands. SQL Server replication is a technology for copying and distributing data and database objects from one database to another and then synchronizing between databases to maintain consistency and integrity of the data. In most cases, replication is a process of reproducing the data at the desired targets. SQL Server replication is used for copying and synchronizing data continuously or it can also be scheduled to run at predetermined intervals. There are several different replication techniques that support a variety of data synchronization approaches; one-way; one-to-many; many-to-one; and bi-directional, and keep several datasets in sync with each other. The following diagram depicts the components of transactional SQL Server replication. An article is the basic unit of SQL Server Replication. An article can consist of tables, stored procedures, and views. It is possible to scale the article, horizontally and vertically using a filter option. We can also create multiple articles on the same object with some restrictions and limitations. Using the New Publication wizard, the Article can be navigated. It allows us to view the properties of an article and provide options to set properties for the articles. In some case, the properties can be set during the time of publication creation and it’s a read-only property. After the creation of a SQL Server replication publication, for instance, if some property requires a change, it will, in turn, require a new replication snapshot to be generated. If the publication has one or more subscriptions then the change requires all subscriptions to be reinitialized. For more information, see How to add/drop articles to/from existing publication in SQL Server article. To get the details of articles in transactional or merge SQL Server replication in a published database, run the following T-SQL. A Publication is a logical collection of articles from a database. The entity allows us to define and configure article properties at the higher level so that the properties are inherited to all the articles in that group. The publisher is a database that contains a list of objects that are designated as SQL Server replication articles are known as publication database. The publisher can have one or more publications. Each publisher defines a data propagation mechanism by creating several internal replication stored procedures. The Publisher is a database instance that makes data available to other locations through SQL Server replication. The Publisher can have one or more publications, each defining a logically related set of objects and data to replicate. The Distributor is a database that acts as a storehouse for replication specific data associated with one or more Publishers. In many cases, the distributor is a single database that acts as both the Publisher and the Distributor. In the context of SQL Server replication, this is commonly known as a “local distributor”. On the other hand, if it’s configured on a separate server, then it is known as a “remote distributor”. Each Publisher is associated with a single database known as a “distribution database” aka the “Distributor”. The distribution database identifies and stores SQL Server replication status data, metadata about the publication, and, in some cases, acts as a queue for data moving from the Publisher to the Subscribers. Depending on the replication model, the Distributor might also be responsible for notifying the Subscribers that have subscribed to a publication that an article has changed. Also, the distribution database maintains the integrity of the data. Each Distributor must have at least one distribution database. The distribution database consists of article detail, replication meta-data and data. 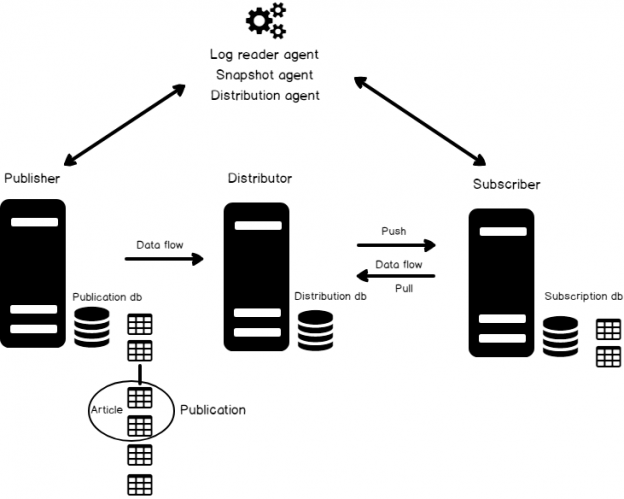 A Distributor can hold more than one distribution database; however, all publications defined on a single Publisher must use the same distribution database. a server is a distributor or not? a distribution database installed or not? a Publisher is using this Distributor or not? or just to interrogate various Distributor and Distribution database properties? A database instance that consumes SQL Server replication data from a publication is called a Subscriber. The subscriber can receive data from one or more publishers and publications. The subscriber can also pass data changes back to the publisher or republish the data to other subscribers depending on the type of the replication design and model. A subscription is a request for a copy of a publication to be delivered to a Subscriber. The subscription defines what publication data will be received, where, and when. Pull subscription: the Subscriber is scheduled to check at the Distributor regularly if any new changes are available, and then updates the data in the subscription database itself. A target database of a replication model is called a subscription database. SQL Server replication uses a pre-defined set of standalone programs and events are known as agents, to carry out the tasks associated with data. By default, SQL Server replication agents run as scheduled jobs under SQL Server Agent. Replication agents can also be run from the command line and by applications that use Replication Management Objects (RMO). SQL Server replication agents can be monitored and administered using Replication Monitor and SQL Server Management Studio. The Replication snapshot Agent is used with all types of SQL Server replication technology as it provides the required data set to perform the initial data synchronization of the publication database with the subscription database. It prepares schema and initial data of published articles, snapshot files, and records information about the synchronization type in the distribution database. The Log Reader Agent is used only with transactional replication. It moves replication transactions from the online transaction log of the publication database to the distribution database. The Distribution Agent is used only with Replication snapshot and Transactional SQL Server replication. This agent applies the initial replication snapshot to the subscription database and later, the data changes are tracked and recorded in the distribution database and applied to the subscription database. Thus far, we’ve seen a walk-through of some of the important concepts of SQL Server replication. Also, T-SQL scripts are shown to query system tables and replication stored procedures to answer most of the commonly asked question about SQL Server replication.